Lynne here! Today’s post was inspired by a blogging link-up (where bloggers share their favorite posts as a way to network and whatnot) called “That’s What She Said”. Every week, they give you a quote and ask you to write a piece inspired by it. This week, we are to write on this.. I am very very loud. And I have been adventurous. But I am also an over-thinker. A mulling-over-thoughts-ad-nauseum person. I am not saying that you should leap off of cliffs without looking. That can literally kill you. But I have found that over the last several years, I tend to toss thoughts back and forth, over and over, until the indecision torments me. And that ain’t good either. I got married at 39, and had my son at 41, so I spent the majority of my life thus far as single and not a mom. And I don’t know how you can be sure of something but also worry at the same time, but that’s me. And before my wedding, then 2 years later when my son was a newborn, I felt God tell me that He had this, and that He was going to give me everything that I needed to be a wife, then a mother. That didn’t mean that it would be easy, and that I wouldn’t have moments when I wanted to run away from everyone who lives with me, or that I wouldn’t have moments when all of it is hard, when the tantrums seem unending, and I can’t seem to remember to change the laundry and have to rerun the loads over and over, and I feel that all that I do is apologize for things that I have neglected, moments when I have dropped every ball I was trying to juggle. But in those moments, under all of the noise, I remember that God promise, because in those whispers He was telling me just what the brilliant Miss Fey said above: that if I said “yes”, we would fill in the blanks. Because for every doubt, there are a million moments that confirm that I am actually not doing a bad job. Dare I say it, I am actually doing a good job. Because we laugh, and we smile, and we eat, even if it is later than I thought it would be. We thrive. And that’s worth all of it. Howdy! Lynne here. It’s been a minute because I have been having computer issues, which seem to have been resolved for now, so I’m back, y’all! So, if you have read The Sweet Midlife at all (and if not, welcome! ), you would know that while we aren’t a food blog, we have written before about what we eat, sometimes in relation to eating better, or because we were trying new vegetables, or just because we made something good. Well, this past week, I made some stuff and I want to tell you about it. And I will say this going in. I am not the neatest person. I don’t know how to draw inside the lines. I have horrible handwriting and I always got an S- in elementary school penmanship. That is Satisfactory Minus. Yes. So even though I do a lot of cooking, and most of it tastes really good, it doesn’t always look great, so even though I will post Facebook statuses ABOUT what I cook, I don’t always post pictures OF what I make. Because it sometimes looks like my toddler made it. But this past week, inspired by Valentine’s Day, I got the idea to make some things that I had never made before, and that had the possibility of looking majorly crazy. I made a cake, but I will write about that in a latter post. But I want to tell you now about the first thing I made this week. 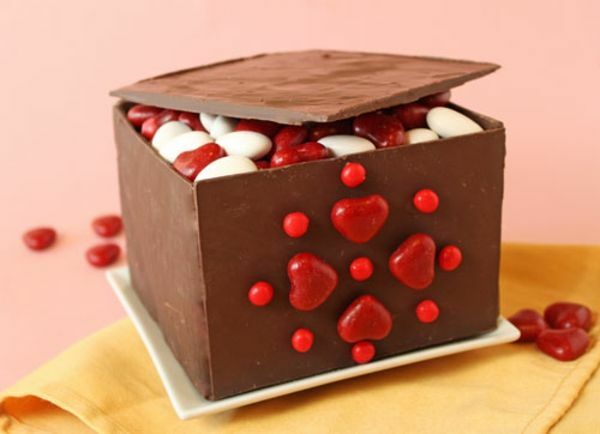 Someone on Facebook posted this recipe for boxes made out of chocolate. Kinda like a gingerbread house, but it is made out of freaking chocolate. And filled with candy. Isn’t this is a thing of beauty? This is the one from a site called Oh, Nuts, and not the one I made. From Ohnuts.com. Not the one I made. And liking those odds, because leftover chocolate, I forged ahead. Even though I tried again to not do it. Because I got scurred. But emboldened by the fact that I told people I was gonna do it, I did it. So, umm. it looked like this. It’s lopsided, and some of it broke, and if it was a real structure, it would be condemned. But it made me smile. Because it actually stayed together and stood up on it’s own. All by it’s crooked, yummy self. Don’t you want to sit on it on a Friday night and get sugared up and make parallels between the purple aquarium lights of your friends’ roommates fish tank and “Purple Rain”, which is playing in the background? What? That’s just me? Okay. Because I totally did that in 1992. And no drugs or alcohol were involved! But back to the chocolate. You get it, right? So, then I tried another one with the rest of the chocolate pieces, because all you have to do is remelt it and start over. And eat more of the leftovers. Yes. And this next one fell apart from the beginning, but it looked like a shelter of some kind, and I made some accessories, and my husband added my son’s brand new drugstore-bought school bus (which is already falling apart, so don’t buy those), and we got Candy Bus Stop. So, yeah. My journey into candy architecture didn’t look like the original picture. But it tasted good. And more importantly: I DID THAT. I am branching out, doing the thing. Because the only thing worse than an ugly chocolate house is the chocolate house you never made. Because seriously, those things are delicious.